We present high spatial resolution observations of ground-state OH masers achieved using the Australia Telescope Compact Array (ATCA). These observations were conducted toward 171 pointing centers where OH maser candidates were identified previously in the Southern Parkes Large-Area Survey in Hydroxyl toward the Galactic center region between Galactic longitudes of 355◦ and 5◦ and Galactic latitudes of −2° and +2°. We detect maser emission toward 162 target fields and suggest that six out of nine nondetections are due to intrinsic variability. Due to the superior spatial resolution of the follow-up ATCA observations, we have identified 356 OH maser sites in the 162 target fields with maser detections. Almost half (161 of 356) of these maser sites have been detected for the first time in these observations. 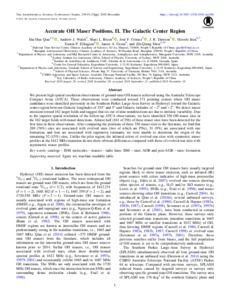 After comparing the positions of these 356 maser sites to the literature, we find that 269 (76%) sites are associated with evolved stars (two of which are PNe), 31 (9%) are associated with star formation, and four are associated with supernova remnants; we were unable to determine the origin of the remaining 52 (15%) sites. Unlike the pilot region, the infrared colors of evolved star sites with symmetric maser profiles in the 1612 MHz transition do not show obvious differences compared with those of evolved star sites with asymmetric maser profiles.